Note: The weight of the container will subtract from the available capacity. 1.Place the empty container or vessel on the weighting platform. 2.Press the “TARE” button. The display will then reset to zero. 3.Fill the container with the quantity to be weighted. 4.The display will show the net weight of the contents. Accurate and Wide Range --This GDEALER food scale is equipped with 4 high precision sensors to provide accurate measurements.11lb/5kg capacity, 0.1oz division, g/oz/lb/ml units to choose, perfect for coffee, cooking, fruit, jewelry and spices for all of your recipes. Slim Fashion Design --0.63 inch super thin design, makes the kitchen scale easy to store in any cabinet while saving space for the rest of your kitchen essentials. And its fashion silver platform give you an amazing sight. 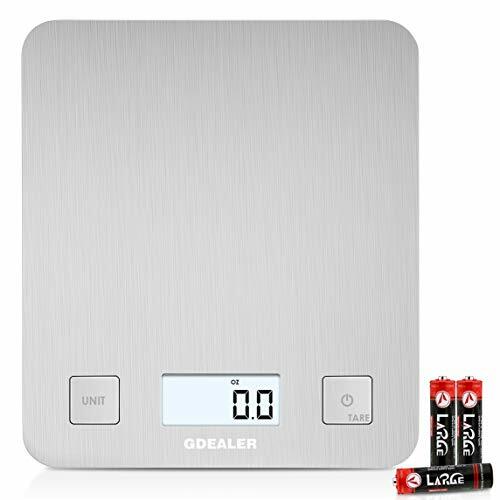 Stainless Steel Platform Design:This digital scale is designed with a sleek stainless steel platform and anti-fingerprint technology for easy to clean and maintain. User-Friendly Design:Tare function can set the weight to zero, multi units conversion, food, liquid measurement supported,back-it LCD display. Quality Guarantee - ***1 Year Warranty Customer Service***: GDEALER offers 1 year warranty for all food scales sold by Global Dealer. Contact us via Amazon message box or info@gdealer.net if you meet some issues or have some advice.